Nothing completes an outfit quite like the right jewelry can. No matter how chic and stylish your clothes are, you need to complement them with cute, on-trend accessories. It only takes a pair of earrings or a few bracelets to completely transform your look. But, if you really want to look your best, you should keep up with the latest clothing and jewelry trends. Here are 10 accessory styles everyone’s going to be wearing this spring. Hoops are one of the most popular kinds of earrings – and for good reason! They give your outfit just the right mix of attitude and glam, and this year, they’re not holding back. It’s time to invest in thick, heavy hoops if you haven’t done so already. This look has made conventional hoops even sassier. But, they’ve also made them more appropriate for high-end looks. If you’ve been a little shy over wearing your favorite hoops to the office or at nice dinners, things are about to change. Swap out your classic thin hoops for heavy ones this spring and wear them anywhere, anytime! As great as heavy hoops are, they’ll get old fast if you wear them every day. That’s why you need to get a pair of drip earrings, too. This is the other major ear candy trend that’s catching everyone’s eye. Drip earrings work whether you have short, straight hair or long, thick curls. They look lovely with your hair pulled back but they can shine when everything is down, too. Do not underestimate the beauty of this up and coming style. Even though the earring trends of this spring are predicted to steal the show, they’ll look even better if you match them with other accessories. Try making a habit of slipping on a few simple rings before you leave the house. You can stack two or three on one finger or spread them out on your hand. Either way, they’re sure to make you feel more put-together. 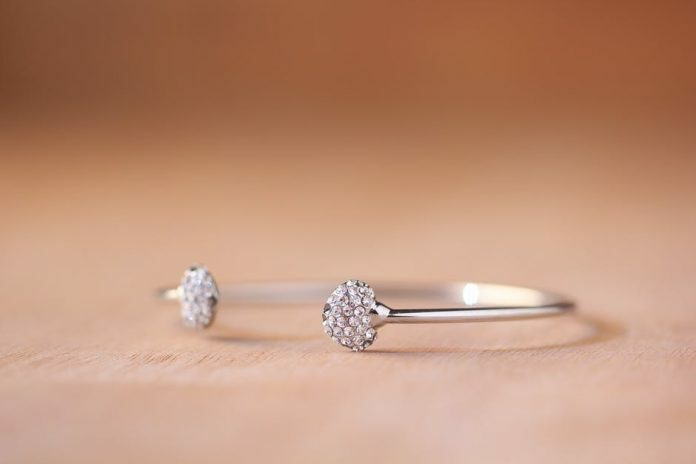 As subtle as simple rings are, they definitely don’t go unnoticed. Up next on the list are layered bracelets. It’s not enough to have one accessory on your wrist anymore. Rather, you should try to combine two or three small, chic bracelets. These will do a better job of catching people’s eye. Plus, it’s fun to play with different combinations and see what kind of styles you can come up with! Stick to bracelets with small chains and similar features when layering them. If you want to do something different, though, opt for a charmed bracelet. That’s right – charms are making a huge comeback this spring. They’re being featured on bold bracelets and popping up on necklaces like this company makes, too. They come in all sorts of shapes, sizes, and materials. This is arguably the most interesting of all the jewelry trends that will be popular this spring: coin-inspired designs. Don’t be surprised if you see round earrings that are a little rough around the edges or look like the metal has been coated unevenly. That’s the whole point! These designs are all about creating texture. They aim to put a fun spin on the way we typically think of single-toned jewelry. But, it’s a trend that will likely appear in eclectic, multi-colored designs, too. Another trend you can expect to see in spring is the use of chains. Thick chains are going to be woven into beautiful bracelets. They’ll be used as the string for necklaces and they’ll stand alone as drip earrings, too. There’s really no limit to how these will be used to create bold new designs. The only thing that’s for sure is you definitely need to get something with this type of style. It’s no surprise to see flowers being used in spring fashions. But, this year’s use of flowers in accessories is going to turn this classic trend on its head. Realistic-looking flower pendants and shapes are popping up on earrings, rings, necklaces, and bracelets this spring. They’re taking the concept of “bold accessories to a whole new level, and you need to be along for the ride. Imagine how amazing you’d look if you paired big floral earrings with a simple, nice dress. Think about how much more fun a classic t-shirt and jeans look would be with a floral-inspired necklace to dress it up. If you can already see yourself in the outfit suggestions mentioned above, you need to expand your jewelry collection to include more bold designs and playful color. Luckily, this spring’s styles will give you plenty of opportunities to do that! There’s going to be a big emphasis on avant-garde fashion this year. You can expect to see this trend live on as the seasons change. But, you can easily keep up with it if you just add a few fun pieces to your closet. Don’t be afraid to try on a huge pair of earrings that call out to you. See how a few of your necklaces would look if you wore them together instead of choosing just one. These are small, simple changes you can make to your wardrobe, but they’ll have a huge impact on how you look and feel. The final jewelry trend to look out for this spring is body jewelry. If you see a long necklace that’s meant to wrap around your waist, try it on. If you notice you can wear a bracelet and connect it to one of your rings, see how it looks. Don’t forget about anklets, either. Jewelry that wraps around the body and that complements unique areas is making waves this year. It’s worth seeing what all the fuss is about. As fun as it is to keep up with the latest trends, there is one downside you have to consider. Your closet needs to be about your personal style, not what everyone else is wearing. But, paying attention to clothing and jewelry trends as they come and go helps you elevate your go-to looks. The key to mastering the world of fashion is to find a balance between what’s hot and what’s not and what feels right for you. For more style tips to help you look and feel your best, click here.